The hardy kiwi can be eaten whole since it has a smooth skin and is about the size of a large grape. It is high in Vitamin C & minerals like its relative, the fuzzy Kiwifruit. Hardy kiwis can take 3-9 years for both male and female plants to reach blossom maturity. Blossoms occur on current year’s growth coming out of last year’s wood. 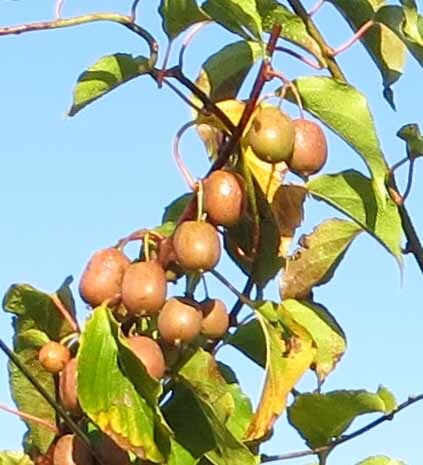 All kiwis prefer rich well-drained soil, need protection from strong winds, and are susceptible to late spring frosts after budbreak which can kill the first emerging leaves. Plant with root crown slightly exposed to avoid trunk rot. May require protection around the trunk initially until established to avoid damage by cats as all Actinidia vines contain a substance similar to catnip! Some hardy kiwis become tinted red as they ripen. Fruit can be ripened on the vine or picked when still hard and ripened indoors in a cool location. 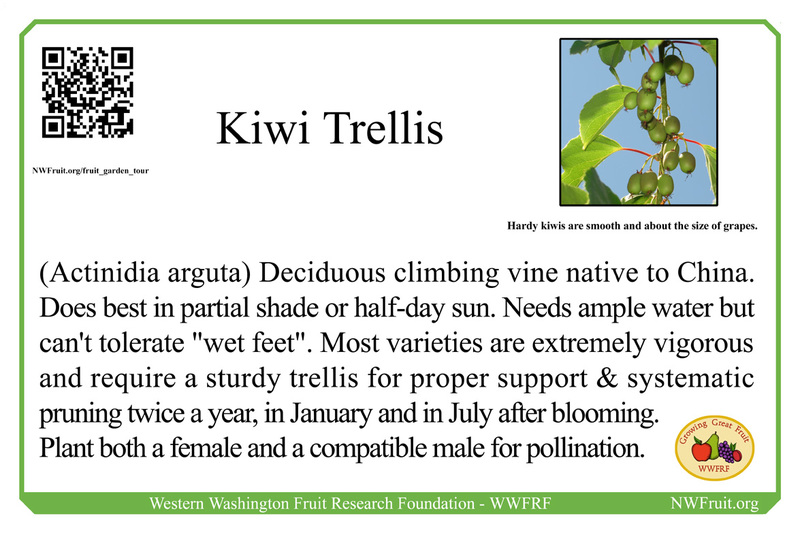 Hardy kiwis need a strong trellis and once established can grow 15 feet or more in a season. Always build the trellis first before planting and keep in mind that kiwis like to have sun to warm their roots. Pruning twice a year in January and July will keep your kiwi fruitful and within the bounds of its trellis. See video below for summer pruning. The video of winter pruning should be up by May of 2017. The variety in the Fruit Garden is Ananasnaja. The fuzzy kiwi Hayward is also in the Fruit Garden at the west end of the trellis.